Please read this complete ad listing before ordering it can save you 20%. Choose 10 Wooden Crosses from the 24 in the pictures, You can mix and match or choose all 10 the same. 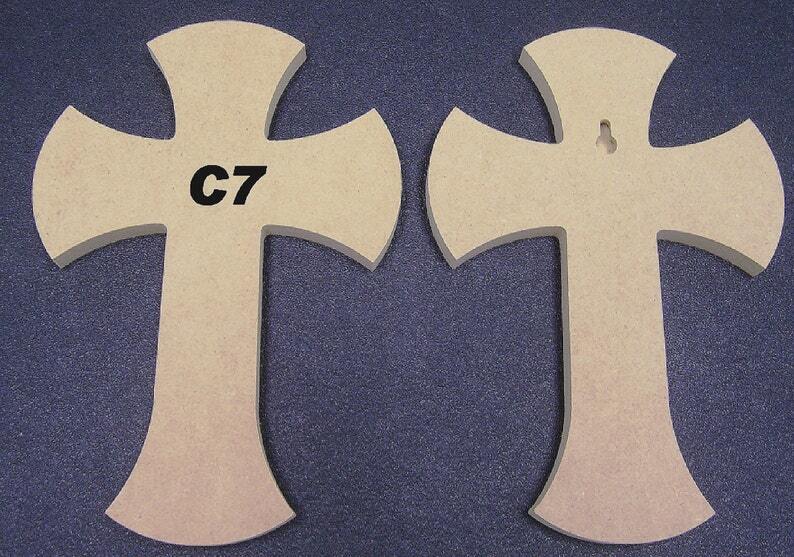 Choose Wooden Crosses from the 24 styles in the pictures, C1 - C24. Comes in 1/4", 1/2" and 3/4" thick. The crosses are 6 x 9 x ( you pick the thickness, all the same thickness ) made from MDF. This listing is for TEN unpainted 6 x 9 inch wooden crosses of your choice, you can pick from 3 different thickness. All of our items are cut from Plum Creek MDF consisting of 80% recycled materials. These crosses are great for church projects, home projects, home decor, gifts, etc. These crosses paint very well to suit your decorative ideas, but they do not stain well. May require light hand sanding. On the left side at the top you will see a drop down box that will want to know what thickness, you can pick from 1/4", 1/2" and 3/4", all the same price. All your crosses will need to be the same thickness. Now add it to your cart, IN BUYER NOTES LIST THE CROSS #'s THAT YOU WANT, you can mix and match, if you have a discount code there will be a box to put it in, IF YOU FORGET to put your discount code in there is no way of going back after you check out and pay.